From the left vertical menu, click Wiki. Within Wiki are just a few pieces of information (which are also repeated here in OPS), but we wanted to have them "at your fingertips". The vast majority of procedures for using Team Support are located only here in OPS or use Team Support>Help>Documentation (their Help guide). For your viewing convenience, the Support Shifts and Support Coverage Calendars have been included in Team Support on the Wiki page. This is a "view only" version. Under the Calendar is "WikiRabbit" which is a collection of short "procedures". Click the down arrow to the right of WikiRabbit to expand the menu, then click the Procedure you want to view to go to that page. Procedures in WikiRabbit are "subject to change" as needed, and they are also included here in OPS somewhere as well (in case TeamSupport is "down"). Generally, Susan controls the Wiki content. Also on the left vertical menu is the Knowledge Base ("KB"). Jackrabbit uses the KB to house "templates" (also called "articles") of commonly used responses to customers. They are arranged by Category and sub-Category. Please review these periodically to make sure you are aware of "the wheel that has already been invented" to save you time in the future. 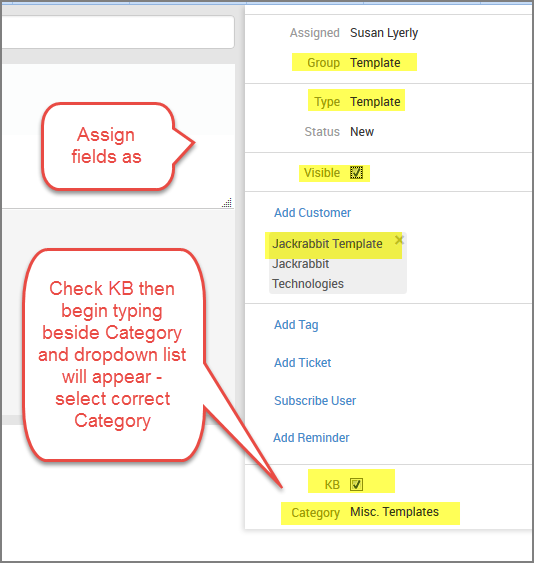 The KB Categories are generally maintained by the Team Lead, and articles are usually approved by either Susan, Laken, or Jan.
You can use any article (template) in the KB that has "approved" in the title. To insert an existing KB article, from inside your ticket use the "Insert KB" icon and begin typing the subject line - it will search and provide you a list and then select the one you are looking for. Alternatively you can go into the KB template ticket number itself and "copy" the body and then back in your own ticket "paste" it in. Use New Ticket button to create new ticket - then add your text and images as needed. Use a Subject line that will help other Reps easily find/use/remember the template name. Change the Group and Type to "Template" and checkmark to Visible. checkmark KB and add the correct Category near the bottom.